Pablo Picasso was born in Spain in 1881. From an early age, Picasso displayed a genius for drawing. 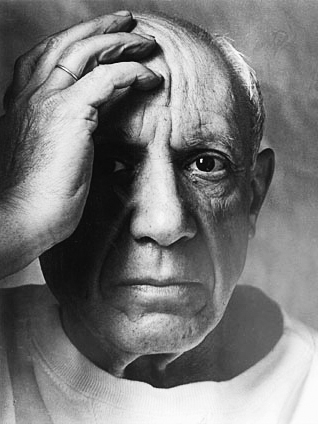 His father trained him in both drawing and sculpture, and Picasso’s first exhibition occurred when he was just 13. In 1895, Picasso enrolled in the La Llotja Art School in Barcelona where he found success as an academic painter; his painting Science and Charity was awarded an honorable mention in 1897. Picasso traveled to Paris in 1900 and the following year he began creating somber paintings in shades of blue, a time referred to as his Blue Period. In 1904 he officially moved to Paris and his color palette moved to warmer colors and subjects, and this time is now known as his Rose Period. In 1908, together with fellow artist Georges Braque, Picasso began to experiment with creating geometrically fragmented works in a style known as “Cubism.” Picasso continued in this genre until 1919, often incorporating paper collages into his cubist works. In 1939, Picasso had his first major retrospective, Picasso: Forty Years of his Art, at the Museum of Modern Art, New York. When the Nazis occupied Paris in 1940, Picasso switched to writing and poetry. After the war he began to create three dimensional works, notably designing and donating the Chicago Picasso to the City of Chicago in 1967. He died in 1973.